It has been suggested that Fletcher–Munson curves be merged into this article. (Discuss) Proposed since April 2018. ISO equal-loudness contours with frequency in Hz. Equal-loudness contours are often referred to as "Fletcher-Munson" curves, after the earliest researchers, but those studies have been superseded and incorporated into newer standards. The definitive curves are those defined in the international standard ISO 226:2003, which are based on a review of modern determinations made in various countries. The human auditory system is sensitive to frequencies from about 20 Hz to a maximum of around 20,000 Hz, although the upper hearing limit decreases with age. Within this range, the human ear is most sensitive between 2 and 5 kHz, largely due to the resonance of the ear canal and the transfer function of the ossicles of the middle ear. Fletcher and Munson first measured equal-loudness contours using headphones (1933). In their study, test subjects listened to pure tones at various frequencies and over 10 dB increments in stimulus intensity. For each frequency and intensity, the listener also listened to a reference tone at 1000 Hz. Fletcher and Munson adjusted the reference tone until the listener perceived that it was the same loudness as the test tone. Loudness, being a psychological quantity, is difficult to measure, so Fletcher and Munson averaged their results over many test subjects to derive reasonable averages. The lowest equal-loudness contour represents the quietest audible tone—the absolute threshold of hearing. The highest contour is the threshold of pain. Churcher and King carried out a second determination in 1937, but their results and Fletcher and Munson's showed considerable discrepancies over parts of the auditory diagram. In 1956 Robinson and Dadson produced a new experimental determination that they believed was more accurate. It became the basis for a standard (ISO 226) that was considered definitive until 2003, when ISO revised the standard on the basis of recent assessments by research groups worldwide. This has resulted in the recent acceptance of a new set of curves standardized as ISO 226:2003. The report comments on the surprisingly large differences, and the fact that the original Fletcher-Munson contours are in better agreement with recent results than the Robinson-Dadson, which appear to differ by as much as 10–15 dB especially in the low-frequency region, for reasons not explained. Equal-loudness curves derived using headphones are valid only for the special case of what is called side-presentation, which is not how we normally hear. Real-life sounds arrive as planar wavefronts, if from a reasonably distant source. If the source of sound is directly in front of the listener, then both ears receive equal intensity, but at frequencies above about 1 kHz the sound that enters the ear canal is partially reduced by the masking effect of the head, and also highly dependent on reflection off the pinna (outer ear). Off-centre sounds result in increased head masking at one ear, and subtle changes in the effect of the pinna, especially at the other ear. This combined effect of head-masking and pinna reflection is quantified in a set of curves in three-dimensional space referred to as head-related transfer functions (HRTFs). Frontal presentation is now regarded as preferable when deriving equal-loudness contours, and the latest ISO standard is specifically based on frontal and central presentation. The Robinson-Dadson determination used loudspeakers, and for a long time the difference from the Fletcher-Munson curves was explained partly on the basis that the latter used headphones. However, the ISO report actually lists the latter as using "compensated" headphones, though it doesn't make clear how Robinson-Dadson achieved "compensation". Good headphones, well sealed to the ear, provide a flat low-frequency pressure response to the ear canal, with low distortion even at high intensities. At low frequencies the ear is purely pressure-sensitive, and the cavity formed between headphones and ear is too small to introduce modifying resonances. Headphone testing is therefore a good way to derive equal-loudness contours below about 500 Hz, though reservations have been expressed about the validity of headphone measurements when determining the actual threshold of hearing, based on observation that closing off the ear canal produces increased sensitivity to the sound of blood flow within the ear, which the brain appears to mask in normal listening conditions. At high frequencies, headphone measurement gets unreliable, and the various resonances of pinnae (outer ears) and ear canals are severely affected by proximity to the headphone cavity. With speakers, the opposite is true. A flat low-frequency response is hard to obtain—except in free space high above ground, or in a very large and anechoic chamber that is free from reflections down to 20 Hz. Until recently,[when?] it was not possible to achieve high levels at frequencies down to 20 Hz without high levels of harmonic distortion. Even today, the best speakers are likely to generate around 1 to 3% of total harmonic distortion, corresponding to 30 to 40 dB below fundamental. This is not good enough, given the steep rise in loudness (rising to as much as 24 dB per octave) with frequency revealed by the equal-loudness curves below about 100 Hz. A good experimenter must ensure that trial subjects really hear the fundamental and not harmonics—especially the third harmonic, which is especially strong as a speaker cone's travel becomes limited as its suspension reaches the limit of compliance. A possible way around the problem is to use acoustic filtering, such as by resonant cavity, in the speaker setup. A flat free-field high-frequency response up to 20 kHz, on the other hand, is comparatively easy to achieve with modern speakers on-axis. These effects must be considered when comparing results of various attempts to measure equal-loudness contours. The A-weighting curve—in widespread use for noise measurement—is said to have been based on the 40-phon Fletcher–Munson curve. However, research in the 1960s demonstrated that determinations of equal-loudness made using pure tones are not directly relevant to our perception of noise. This is because the cochlea in our inner ear analyzes sounds in terms of spectral content, each "hair-cell" responding to a narrow band of frequencies known as a critical band. The high-frequency bands are wider in absolute terms than the low frequency bands, and therefore "collect" proportionately more power from a noise source. However, when more than one critical band is stimulated, the signals to the brain add the various bands to produce the impressions of loudness. For these reasons Equal-loudness curves derived using noise bands show an upwards tilt above 1 kHz and a downward tilt below 1 kHz when compared to the curves derived using pure tones. 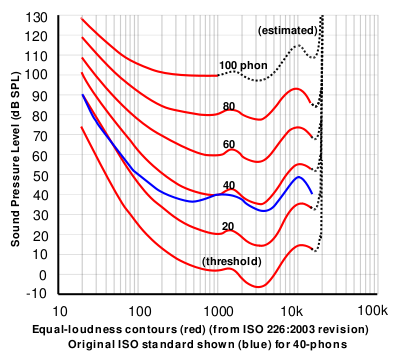 Various weighting curves were derived in the 1960s, in particular as part of the DIN 4550 standard for audio quality measurement, which differed from the A-weighting curve, showing more of a peak around 6 kHz. These gave a more meaningful subjective measure of noise on audio equipment, especially on the newly invented compact cassette tape recorders with Dolby noise reduction, which were characterised by a noise spectrum dominated by the higher frequencies. BBC Research conducted listening trials in an attempt to find the best weighting curve and rectifier combination for use when measuring noise in broadcast equipment, examining the various new weighting curves in the context of noise rather than tones, confirming that they were much more valid than A-weighting when attempting to measure the subjective loudness of noise. This work also investigated the response of human hearing to tone-bursts, clicks, pink noise and a variety of other sounds that, because of their brief impulsive nature, do not give the ear and brain sufficient time to respond. The results were reported in BBC Research Report EL-17 1968/8 entitled The Assessment of Noise in Audio Frequency Circuits. The ITU-R 468 noise weighting curve, originally proposed in CCIR recommendation 468, but later adopted by numerous standards bodies (IEC, BSI, JIS, ITU) was based on the research, and incorporates a special Quasi-peak detector to account for our reduced sensitivity to short bursts and clicks. It is widely used by Broadcasters and audio professionals when they measure noise on broadcast paths and audio equipment, so they can subjectively compare equipment types with different noise spectra and characteristics. ^ D W Robinson et al., "A re-determination of the equal-loudness relations for pure tones", Br. J. Appl. Phys. 7 (1956), pp.166–181. ^ Yôiti Suzuki, et al., "Precise and Full-range Determination of Two-dimensional Equal Loudness Contours" Archived 2007-09-27 at the Wayback Machine. ^ Bauer, B., Torick, E., "Researches in loudness measurement", IEEE Transactions on Audio and Electroacoustics, Vol. 14:3 (Sep 1966), pp.141–151. ^ Ken’ichiro Masaoka, Kazuho Ono, and Setsu Komiyama, "A measurement of equal-loudness level contours for tone burst", Acoustical Science and Technology, Vol. 22 (2001) , No. 1 pp.35–39. Audio Engineer's Reference Book, 2nd Ed., 1999, edited Michael Talbot Smith, Focal Press. An Introduction to the Psychology of Hearing 5th ed, Brian C.J. Moore, Elsevier Press.